Almudena Rincon | The PHOENIX Students and faculty participated in a strike and walkout April 4 after the union failed to reach a contract agreement April 2. The union has since reached a tentative contract agreement with the university. Some non-tenure track faculty at Loyola said they think a tweet published by the school’s Twitter account was misleading in explaining the reason for a student walkout and protest. Non-tenured track (NTT) faculty in the College of Arts and Sciences went on strike April 4 to protest the university’s response to ongoing union negotiations. Members asked for a 67 percent pay increase among other requests, The PHOENIX previously reported. Some students participated in the demonstration to support NTT faculty and the #NotMyLoyola movement by walking out of class. 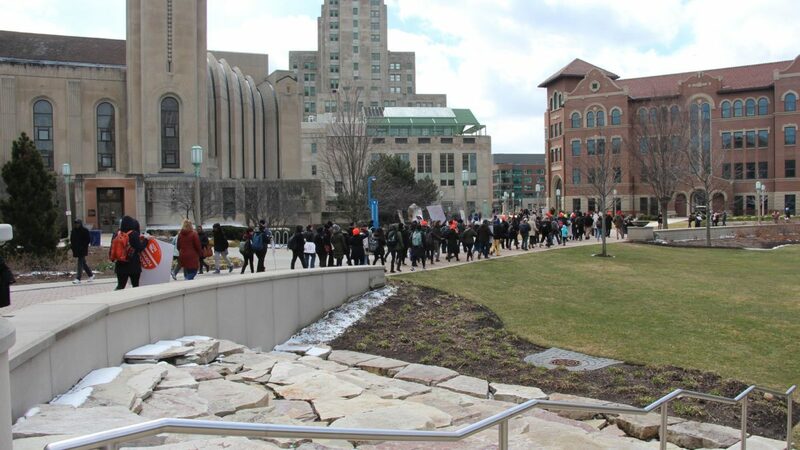 The university made tentative agreements with the union April 16, which will be voted on Thursday and Friday. The university posted on its official Twitter account the morning of the scheduled walkout saying it was to honor Dr. Martin Luther King Jr. who was killed 50 years ago this month. On this 50th anniversary of Dr. Martin Luther King, Jr.’s assassination, we understand members of our community are planning a class walkout to honor him. Loyola supports peaceful, lawful demonstrations and welcomes constructive dialogue on issues of importance to our community. 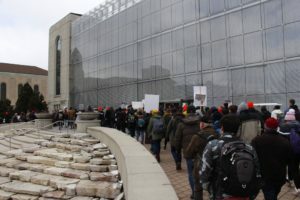 There was an on-campus event to commemorate the death of Martin Luther King Jr. held at Loyola’s Water Tower Campus in the evening, according to the university calendar. Terry Boyle, a NTT English professor, has been involved with the union and said the tweet didn’t show the full scope of what happened. “It was a very slanted truth to try and dilute the frustration and the protest and the sense of protest that we actually felt,” he said. Union organizer and NTT English professor Alyson Paige Warren said the April 4 strike was planned to align with the assassination of King. King was a key civil rights leader in the 1960s who was shot and killed in Memphis April 4, 1968 — where he’d gone to support striking sanitation workers. Warren also said she thought the tweet wasn’t true to the university’s response to demonstrations in the past. “That tweet in words does not reflect what the university has done or is doing in practice,” she said. Public relations professor Herb Ritchell worked in the field for 25 years with multiple senior positions. He said he didn’t think the tweet was necessarily targeting the NTT faculty strike. First-year student Emily Been said she went to the rally to support one of her NTT professors. Been, 19, said she felt the university hasn’t acknowledged the issue adequately. “I feel like [the tweet] was their … way of trying to put a positive spin on [the walkout],” the art history major said. Evangeline Politis, a spokeswoman for Loyola’s administration, didn’t respond to questions about the tweet.